The frame widget is a bin that surrounds its child with a decorative frame and an optional label. If present, the label is drawn in a gap in the top side of the frame. The position of the label can be controlled with Gtk.Frame.set_label_align(). The Gtk.Frame implementation of the Gtk.Buildable interface supports placing a child in the label position by specifying “label” as the “type” attribute of a <child> element. A normal content child can be specified without specifying a <child> type attribute. Gtk.Frame has a main CSS node named “frame” and a subnode named “border”. The “border” node is used to draw the visible border. You can set the appearance of the border using CSS properties like “border-style” on the “border” node. The border node can be given the style class “.flat”, which is used by themes to disable drawing of the border. To do this from code, call Gtk.Frame.set_shadow_type() with Gtk.ShadowType.NONE to add the “.flat” class or any other shadow type to remove it. Creates a new Gtk.Frame, with optional label label . If label is None, the label is omitted. the text in the label, or None if there was no label widget or the lable widget was not a Gtk.Label. This string is owned by GTK+ and must not be modified or freed. Retrieves the X and Y alignment of the frame’s label. See Gtk.Frame.set_label_align(). the label widget, or None if there is none. Retrieves the label widget for the frame. See Gtk.Frame.set_label_widget(). Retrieves the shadow type of the frame. See Gtk.Frame.set_shadow_type(). Removes the current Gtk.Frame :label-widget. 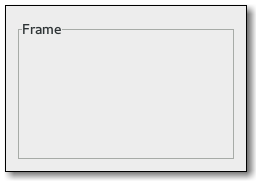 If label is not None, creates a new Gtk.Label with that text and adds it as the Gtk.Frame :label-widget. xalign (float) – The position of the label along the top edge of the widget. A value of 0.0 represents left alignment; 1.0 represents right alignment. yalign (float) – The y alignment of the label. A value of 0.0 aligns under the frame; 1.0 aligns above the frame. If the values are exactly 0.0 or 1.0 the gap in the frame won’t be painted because the label will be completely above or below the frame. Sets the Gtk.Frame :label-widget for the frame. This is the widget that will appear embedded in the top edge of the frame as a title. Sets the Gtk.Frame :shadow-type for self , i.e. whether it is drawn without (Gtk.ShadowType.NONE) or with (other values) a visible border. Values other than Gtk.ShadowType.NONE are treated identically by Gtk.Frame. The chosen type is applied by removing or adding the .flat class to the CSS node named border.